One of the many benefits of artificial turf is the ability to install your lawn yourself. As one of the top suppliers for artificial turf Sydney and Brisbane wide, we’ve seen for ourselves just how popular these turfs are among homeowners and property managers. Our experience as artificial turf Brisbane experts also shows us that DIY laying of turf is common across Australia. If you’re planning to lay artificial turf yourself, then you need to make sure you know how to do it right. Each turf supplier has their own recommendations for how to install their product, and you should follow their instructions to get the best results. No matter what steps you take to lay your artificial turf, you’ll find the following to be the general process for doing it. The first step to laying your artificial turf is to remove any existing lawn in the area that you’re installing your turf in. Use a spade or turf cutter to remove the old lawn or existing turf, and make sure to also remove rocks, sand, and other fillings that were previously applied to your old lawn. Once you’ve removed your old lawn, the next step is to prepare the soil, which often involves removing the top soil. Dig into the soil to a depth of about 60mm (or up to 100mm or more if you’re going to be parking vehicles on your new turf). Aim to make it as level as possible after digging. If you’re installing your artificial turf over soil that doesn’t drain well, then you should also consider installing a drainage system to make sure it can handle strong rainfalls and wet conditions. After preparing the soil, set a clear perimeter around your turf. You can also install a border made of plastic bender boards or other waterproof materials that will help keep your artificial turf stable. If you do install a border around your turf, make sure that the border will sit below grass level to avoid drainage issues. If your assigned area is prone to weeds, then a weed barrier may be necessary. Install a weed barrier over the prepared soil to help prevent weeds from growing through your turf. Make sure to overlap any seams of your weed barrier by 6-12 inches and to secure the barrier seams and perimeter properly. If you have pets (or will be having pets soon), then you may also want to apply pet waste absorbers to help manage odours. After applying protective layers on top of your soil, it’s time to apply the base material. You can use crushed rock, sand, gravel, and other types of road base for this layer. The key is to fill enough of these materials to create a strong base layer for your turf. Make sure to pack it in tightly and let it stay compact. You can use a hand tamp, plate compactor, or rolling compactor to help you pack your road base in. Keep at it until the layer of road base is strong, smooth, and sturdy. If you’re using gravel or sand as your road base, you can moisten them with a hose before compacting to help it come together – just make sure you don’t make it too wet that it sinks your road base when compacted. Lay your artificial turn over the base layer, placing it carefully over the base layer rather than dragging it through. Some suppliers recommend letting it sit out in the sun for a few hours to let it acclimate to its new location and allow its blades to loosen and settle. You should also lay your turf so that all its grass blades go in one direction. This will give it a more natural look. If your lawn requires turf joins, then you should connect them properly to make your lawn look seamless and natural. This requires cutting off each side of the adjoining turfs at least two stitch lines from the edge and using appropriate joining tape or other joining products. Trim the edges of your turf according to the shape and design of your lawn. Use a utility knife or other appropriate tool to help make trimming easier. After making all the necessary adjustments to your new lawn, brush it with a power broom or broom with stiff bristles. This will help the blades of your turf settle and remove any debris that may have lodged on the surface during installation. You can also spread some filler material such as crumb rubber or silica sand throughout your turf to provide added strength and help maintain a level surface. As easy as it may seem to lay artificial turn on your own, there are times when expert guidance and professional services are required. If this is the case for you, don’t be shy getting help from professionals – that’s what they do best! Need more information about how to lay artificial turf properly? Contact our artificial turf Sydney specialists to find out more. 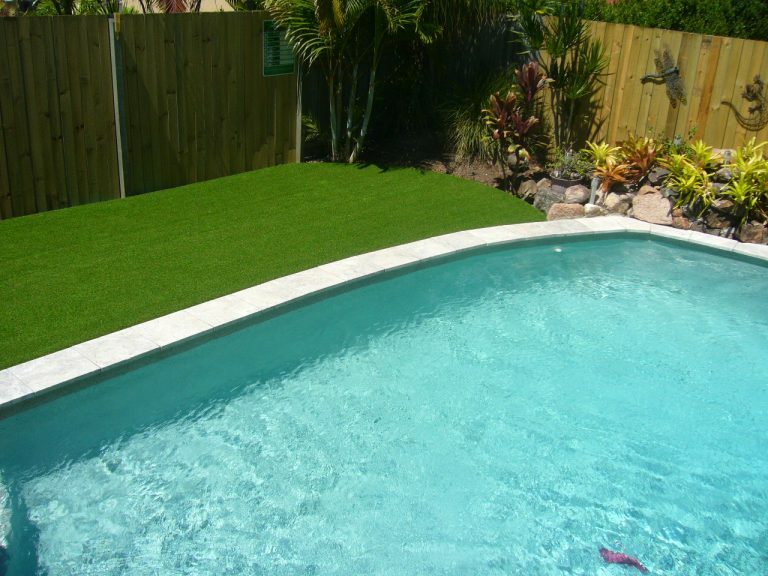 We also supply artificial turf Brisbane wide, across Sydney, and other locations around Australia. « Synthetic Grass Is Not Dirty! Synthetic vs. Real Grass – Which is Right for You? Which Is The Best Artificial Grass That Stays Cool? Finding great artificial grass in Sydney or Brisbane is easy with the team at Surface-it.